In volume four of The Frost Saga, J.E. Fender masterfully weaves together two narratives that offer new perspectives on the American Revolution and on the character of Geoffrey Frost. At the conclusion of volume three, Frost set off in search of his younger brother Joseph, who had recently fought in the battle of Valcour Island on Lake Champlain. This volume tells the story of Joseph's adventures in New York and Vermont as he joins Benedict Arnold in one of the most important battles of the Revolution: despite their defeat at the hands of the superior British fleet, the Americans thwart the British plan to drive down Lake Champlain and the Hudson River to divide the fledgling United States. In alternating chapters, Fender tells the story of Geoffrey Frost's first voyage: when Frost was ten years old, his father placed him aboard a slave ship in order to learn the sea. As young Geoffrey matures from seasick invalid to accomplished sailor, he grows ever more dismayed at the nature of the trade in which the ship is engaged. His formative experiences aboard The Bride of Derry, especially his conflicts with the martinet Captain Wick Nichols, reveal the origins of the "great navigator, ingenious military commander, and fierce armed combatant" (Booklist) known to fans of the series. 5 3/4 x 8 3/4 trim. J.E. FENDER is legal counsel for the Portsmouth Naval Shipyard in Portsmouth, New Hampshire--the U.S. Navy's oldest shipyard. He is author of three previous volumes of The Frost Saga: The Private Revolution of Geoffrey Frost; Audacity, Privateer Out of Portsmouth; and Our Lives, Our Fortunes. 9. 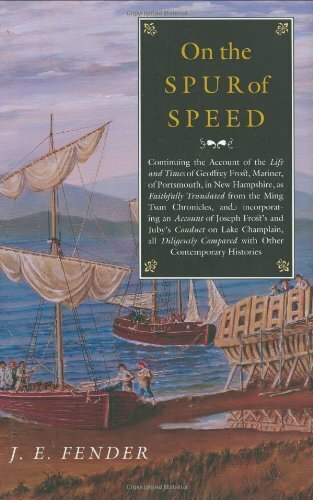 On the Spur of Speed: Continuing the Account of the Life and Times of Geoffrey Frost, Mariner, of Portsmouth, in New Hampshire, as Faithfully . (Hardscrabble Booksâ "Fiction of New England) Fender, J. E.